Lyon is full of heritage. And it should be: it’s got over 2,000 years of history and a Roman amphitheater to prove it. Naturally you’ll never be stuck with things to see, learn and eat (this is France after all) in Lyon. We’ve crafted a handy guide for the best things to do in Lyon so you don’t have to spend your time trawling the internet for what’s good – or not. Whether you’re food obsessed, an outdoors type, or a history lover, there’ll be something to suit you. Plus, our travel experts have you covered with our other amazing guides, all set to save you time and money. Find the best hotels in Lyon, plus the top neighborhoods in Lyon. If you’re travelling around France, be sure to check out the the 45 best things to do in France, our ultimate guide to the most amazing things to do in Paris, day trips from Paris, plus where to stay in Paris and the best hotels in Paris. There’s plenty of fun to be had in this French city. Some of it involves food but almost all of it involves breezing around Lyon and soaking up all of its loveliness. The most fun things to do in Lyon await you. Let your inner foodie loose in Lyon as you tour along the town’s old passageways and dip in and out of delicious eateries serving up local delicacies. A super fun thing to do in Lyon, you’ll get to taste no less than 17 different dishes! You can set off on your food odyssey around the city with a local guide who’ll help you out with uncovering some of the tastiest snacks around. Meander through Vieux Lyon, one of the oldest districts in the city, and saunter along the secret passageways called Traboules formerly used by the city’s silk merchants and weavers. There are many different places to stop off at, all of which sell mouthwateringly divine products. Taste your way around the various streets in the old city and get chatting with the local characters who own the various patisseries and delis. Enjoy seeing some of Lyon’s most famous sights! Take the stress away from exploring the city and take a walking tour around all of the places you want to see. The best thing to do in Lyon if you’re seeing the city for the first time and only have a few days to see the sights, take a private walking tour and you’ll never have to contend with getting lost – or missing anything important. You can spend the tour being shown around Lyon’s Saint-Jean neighbourhood with its truly enchanting Saint-Jean Cathedral. Take a stroll along the charming Juiveries Street and peer into the stylish Hotel Gadagne. Being shown the best parts of the city by a local means you’ll get to hear all sorts of fascinating stories and learn about hidden local gems that you wouldn’t otherwise discover. Make sure to ask about Lyon’s network of ancient underground passageways (yes: these exist). Relax and enjoy the sites! Yes, you read that correctly. You can actually cruise around the city in an electric tuk-tuk. No, it’s not Southeast Asia, but Lyon does have its very own fleet of electric tuk-tuks and you can happily zip around the city in one. Fun things to do in Lyon don’t get much better, or kooky, than this. The tuk-tuk in question is more like a golf buggy, but apart from that you still get to see the city’s top attractions in an easygoing and eco-friendly style. It’s actually a very relaxing way to see the sites, just hop off and on as you wish and stop off for pictures and all important snacks along the way. There’s no need to worry about getting lost or catching buses: just sit back and relax as your driver takes you to wherever you want to go. It’s France: it’s going to be romantic whatever you do. But with all of its charming heritage buildings, storied Old Town and beautiful food, you’ll never be short of romantic things to do in Lyon. Lyon is a beautifully charming and historic city and is best seen during a cruise along the river which runs through its heart – and most especially in the evening when the city is elegantly illuminated. So why not upgrade that boat ride; enjoy a dinner on board a boat and set sail for a luxury cruise through the city. Aboard the Hermès restaurant boat, you’ll be wined and dined by the team of very welcoming staff. A delicious 3-course dinner will be served and you’ll be able to see the many famous city sights along the way. Sit in the upstairs restaurant area at stylish tables and sip champagne with your other half. Doesn’t this just sound like the most leisurely romantic thing to do in Lyon? Head out for dinner in style, wining and dining your other half at a Michelin star restaurant. The famous French chef’s restaurant has been a mainstay of Lyon’s food scene for years; it regularly gets diners who travel for miles to delight in the divine delicacies served up here. One of the most delicious and romantic things to do in Lyon, eating at this restaurant for either lunch or dinner is a spectacular experience. 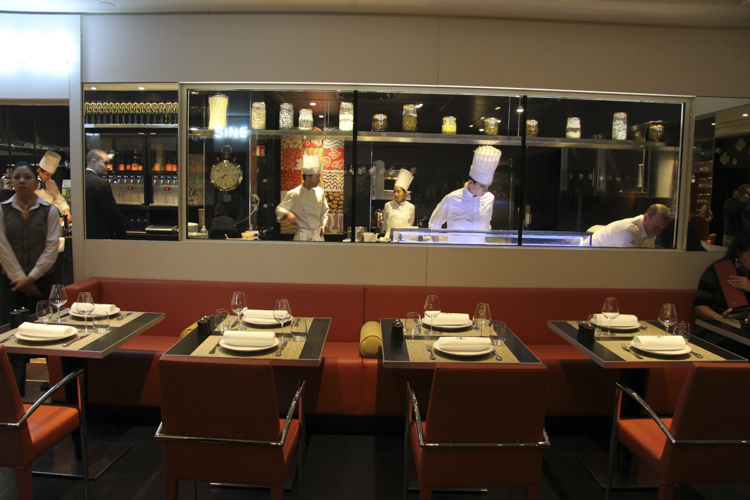 Order one of the specialities, such as truffle soup, and sample the Bresse chicken or the red mullet. Your mouth is going to be watering from the moment you walk through the door. The sommelier will help you to choose the perfect bottle of wine, whilst the all-round service is top notch, creating the perfect calm and low key environment to enjoy a special meal. History, architecture, culture, food; Lyon has it all. But what are things are there to do in Lyon if you’re on holiday with children? We’ve found a few fun things that will occupy your little ones – and you! Children love treasure hunts – there’s no two ways about it. So a great way to spend a day of family fun is to embark on a treasure hunt that will literally take you across Lyon to explore the city whilst you hunt for clues. Now how does that sound for something to do in Lyon with kids in tow? You’ll be driven around the city by a guide, who’ll not only tell you about the sights you’re seeing but also drop subtle hints about the treasure hunt. Be sure that you and your children remember what they say: you’ll need it when the guide starts asking questions that will help you solve the puzzle at the heart of the treasure hunt itself. Sound mysterious? That’s because it is: it’s a treasure hunt! Mini World is exactly what it says it is: an amazing world of mini things. This automatically makes it one of the best things to do in Lyon with kids. How could you resist seeing the sights of the city in miniature? The museum is super fun for small children (as well as grown-ups) who won’t be able to help themselves from wanting to playing with the moving funfair rides, chugging trains and animated construction sites. The constantly moving mini world is bound to captivate your children’s imagination as they peek into the various tiny cities, seeing the small adventures unfolding and the figures having fun. There’s various landscapes to explore and intricate details to seek out; yes, a day here is a lot of fun indeed. There’s a good way to get children excited about sightseeing in the city, and that’s to provide them with an unusual mode of transport to whisk them from one place to another. A boat is a good way to captivate children in that way. So if you want something to do with children in Lyon, hop on a short boat cruise that will have you and your family sailing on the Saône River. You’ll travel through the centre of Lyon, watching all of its beautiful buildings glide by from the boat. Though your children might be more interested in waving at other boats and people on the riverbank! And to round it up, disembark at the Musée des Confluences – a super fun science museum that’s bound to have your little ones enthralled from the start. There’s much more to this city than things you have to pay for. In fact, there’s a lot of cool free things to do in Lyon, which is great news for anybody on a budget, or even if you’re backpacking around these parts. This stunning Basilica stands out from the scenery in Lyon. It can be seen from all over the city as it sits proudly on the hill above. A really special place to spend some time exploring, it’s also a wonderful place to simply sit and take in the views of the city below. You can opt to take the funicular railway to the top of the city in order to reach the huge white building, but making the climb up to see it is free and you get to see a whole lot more of the city this way, too. The interior of the church is impressively ornate with intricate ceilings, divine mosaics and detailed stained glass. From soaking up the serenity inside the church, take a moment outside to watch as the sun sets across the rooftops before making your way back down to enjoy the city at night. Take time out from the warren of buildings and urban sprawl in one of the city’s nicest slices of greenery: Le Parc de la Tête d’Or. Formerly a sort of swamp land which was constantly flooded by the river, a public park was proposed in the early 19th century and opened in 1857. So, for a slice of fresh air and a chance to get out into nature without even having to leave the city, a trip to this public park is a fantastic free thing to do in Lyon. You can walk around the botanic garden here, stroll around the beautiful rose gardens (there are four), or simply wander through the wooded areas, featuring trails and sweet bridges over little creeks. There’s even a boating pond if you fancy parting with a few euros to have a relaxing row. This chic little neighbourhood is the place to explore if you want to see the young, creative side of the city. In recent years Croix Rousse has built up a reputation for being a hub of cool and it’s really not hard to see why. There’s plenty of stylish places to hang out, trendy cafes where you can grab a coffee, and trendy boutiques for some window shopping. Like many cities, things to do in Lyon aren’t just exclusively daytime-based. No, there’s a lot to do when darkness falls and the city lights up. From restaurants to bars and clubs, there’s almost no end to the fun times you can have in Lyon at night. Ok, so going around Lyon on a Segway after dark doesn’t sound like the safest of options, but hold your horses. This city gets illuminated beautifully at night time, making us wonder why the only French city to get called ‘City of Lights’ is Paris. One of the most fun things to do in Lyon at night – especially if you’re not of the lively nightclub persuasion – this segway tour allows you to see a different side to the city. And since it’s night time there’s an extra element of silliness involved in proceedings. Though you will have to wear a helmet. But it’s also beautiful in a different way: the monumental architecture that characterises Lyon is lit up at night, so you can’t help but be awed at this new, breathtaking side to the city. If you’re in the mood for dancing late into the night then you should make your way to Lyon’s Confluence neighbourhood to check out Le Sucre. This is an exciting club which is sat on the roof of an old sugar factory (hence the name) and is a forward-thinking venue that hosts a whole load of brilliant nights. The kind of place that you would go to all the time if it were in your home city, Le Sucre is a cultural clash of a chic cocktail hour hangout, low-key dinners, creative happenings and techno nights. This definitive hub of cool provides a place in the city for people to enjoy a slice modern art and see emerging musical talents. Alongside that, well, it’s generally a fun, interesting place to hang out. The name of this restaurant in Leon may give you a clue to what they serve: cheese. And there’s plenty of it on the menu. Tucking into a hearty dinner in the very French surroundings of Les Fromagivores (‘The Cheese-eaters’) which is one of the best things to do in Lyon at night. There is an absolutely massive choice of cheese on offer which you can heartily wash down with a glass or more of the small but very delicious selection of wine too. Make sure to order one of their charcuterie boards to accompany the meal and spend a long and enjoyable evening in the relaxing atmosphere as you fill up on cheese, enjoy good company and friendly service. And more cheese. Get here early at the weekend, it’s a popular spot so you need to arrive before 8pm to secure a table. There you have it – our guide to the best things to do in Lyon. There’s plenty of history to explore, plenty of chances for romance, and – believe it or not – a lot of fun to be had if you travel here with children. And, of course, food features a lot on our list. That’s because the food in Lyon is amazing. And it’s often the best way to discover a city: simply by searching for restaurants and snacks to eat you get to explore down streets with no tourist attractions. We hope you’ll find something that suits you thanks to our guide. All you have to do now is book a trip and get ready for fun! P.S Here are some other AMAZING articles that will save you time and money for your trip!